Once upon a time, we joked about reviewing Lanard's The Corps! figures because there wasn't enough GI Joe product to allow us to continue doing our regular "Joe Friday" review. Ogre is the older brother of Troll and the muscle of the two. Separated from his brother during the Russian conflict, Ogre resorted to a life of crime. Eventually being caught by the top mob boss of a Russian Crime Syndicate and raised in the ranks of the "family". By the age of 18 Ogre was already 6 feet 8 inches tall and the undefeated champion of an underground fighting league owned by the Russian Crime Syndicate. Ogre specialized in "ambush style" warfare using his skills in large munitions and berserker style brawling to dominate his opponents. After fighting alongside his brother in the Marauders, The Curse! offered to enhance his strength. Their nanotech would line his muscles making him incredibly strong, fast, and strikingly agile. Because of his giant size The Curse! could inject Ogre with a triple dose of nanotech that would have broken most soldiers. Now he is the strongest brute the world has ever seen. With Ogre and his brother fighting for The Curse! they seemed almost unstoppable. Okay, well we're off to an interesting start. There was a time when The Corps! toys didn't have anything more than a name, but here we've got an entire filecard-style backstory for this guy. Yes, it's only available on the website, not on the packaging, but it's not like Hasbro actually maintains all the Joes' information anywhere, right? And since you don't know anything about the Corps! story, let us fill you in: The Marauders were The Corps!' version of Cobra: the organized enemy the good guys fought. 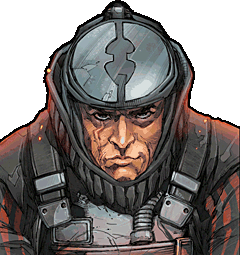 But apparently Alex "Rucker" Brody is a better leader than Clayton "Hawk" Abernathy is, because unlike the Joes, the Corps! actually managed to win their war. The Marauders were defeated. And then a new enemy arose - The Curse. Sorry, The Curse! Just like The Corps! is properly spelt with an exclamation point, so too is The Curse! Exxtreme! Like we said before, The Corps! line is based on a lot of mold re-use, and in this set, Ogre fills that slot. The body has been in use for more than a decade, originally showing up as one of the good guys before later being reused for "Ravage," the leader of the Marauders. It makes a ton more sense for a munitions expert like Ogre than it did for a generic BUCKS soldier, because it looks like bomb squad gear and not an NBC suit - that's "NBC" as in "Nuclear/Biological/Chemical," not "NBC" as in "we're showing you the Olympics right now." 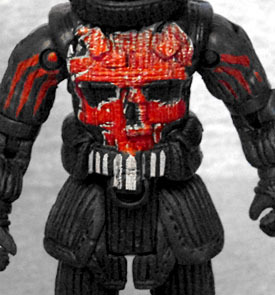 The sculpted lines make it look padded, while the Punisher-inspired skull on the chest makes him look villainous. And wow, are those paint apps intricate! Despite being reused from one of the good-guy characters, the head looks entirely villainous! Is this a thing like Sigma 6 Firefly, where he was secretly undercover? Axle Broz has a big ugly scar running down his face, so maybe he should learn to keep his facemask down when disarming bombs. Unfortunately, he can't: although the sculpt makes it look like it should be hinged, it's a solid part of the mold. If Ogre is really supposed to be 6'8", then he must be squatting down inside his suit, because even with the added height of the helmet, the toy is a little less than 4½" tall. He's articulated like a Generation 2 GI Joe (which makes sense, considering the mold's year of origin), with a swivel neck, swivel/hinge shoulders, swivel biceps, hinged elbows, T-crotch, and hinged knees. 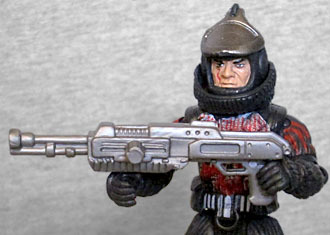 His only accessory is a giant silver shotgun that actually seems like it would be better sized for a 6" figure - it can barely even fit in his hands thanks to the size of the grip! There is a large peg that allows it to plug into his back, however. 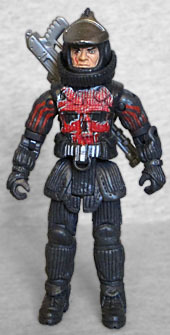 While Ogre was available alone in a "Solo Elite" release, you could also get him in a "Faction Face-Off" two-pack with Snake Bite. She grew up in the Australian Outback where she traveled the plains protecting endangered species. 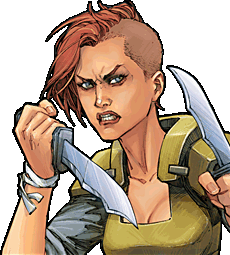 While with her father, she developed a wide range of skills including diverse fighting styles, knife skills, and powerful immunities to almost every venomous and poisonous animal or plant. By the age of 20 she joined the Australian Special Operations Command Unit. Snakebite surpassed everyone's expectations despite being one of the only women in the unit. They say that with just two knives she could take out an entire team of enemies without ever being detected. Her incredible abilities stem mostly from her Kapoeta, and other martial arts training. The Corps! quickly caught word of her hand-to-hand combat skills and immunity to toxins. Needing someone who could fight on the front lines without risk of getting infected by The Curse! A.I. Virus, The Corps! invited her to join their ranks. Now The Corps! can advance on The Curse! with one of their strongest new allies, Snakebite. Nasha Raven is "Snakebite" on the website, but "Snake Bite" on the packaging. Either way, it's hard to ignore the symbolism of giving the redheaded girl a name with the word "snake" in it. Lanard loves thumbing its nose at Hasbro, no question. Also, as long as we're talking about things they put on the toyline's website, how about this artwork! If it seems of a higher quality than you'd expect from the Filene's Basement version of GI Joe, you're not wrong - it was done by Leinil Francis Yu, the artist behind Secret Invasion and several other major Marvel comics. Dang, Lanard, way to splurge on the packaging design! Snake Bite is a new mold, because The Corps! has never had female figures before. Since GI Joe can always use more women, she's the entire reason I wanted this set. 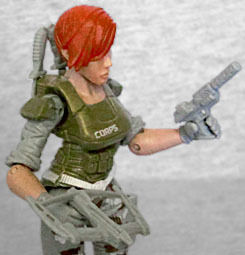 The body is a nice design that would look right at home among G3 Joes: she's wearing boots with a knife sheathed on the left ankle, camouflage pants with reinforced flexible panels on the inside of the legs, a tactical vest with ammo pouches and extra armor on the shoulders, a shirt with the sleeves rolled up, and a pair of gloves. The colors are rather dull - the gray and green are very similar, and the camo is only applied to the fronts of her legs. I guess corners had to be cut somewhere. Another flaw with the figure is the slightly too-large head. 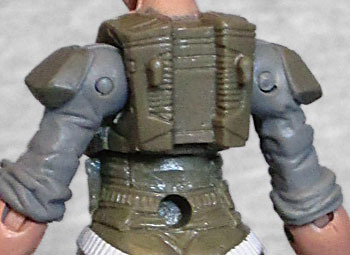 Yes, vintage Generation 1 Joes had noggins that were a bit too big for their bodies, but that's been fixed over the years - Snake Bite, however, seems to keep that old trend alive. Credit goes to them for sculpting the stubble on the shaved side of her head, though - that would have been easy to skip. While the sculpt is generally as good as a G3 GI Joe, the articulation isn't quite there. She has a balljointed head (with such a little range of motion that Mattel DC fans will recognize the disappointment instantly), swivel/hinge shoulders, swivel/hinge elbows, a very stiff balljointed chest, balljointed hips, and hinged knees. Honestly, that's not bad. Her accessories include a silenced pistol, a mini-crossbow (we see what you did there, Lanard), and a pair of knives - the perfect choice, since her primary skills include Tactical Knife Combat and a blackbelt in the non-existent martial art of "kapoeta" (Kapoeta is a Sudanese town; the fighting style is capoeira). Impressively, all her weapons can be stored on the figure, with nothing left lacking. You could also get both these figures with a third (Austin "Buckshot" Colt) and a motorcycle in a "Triple Threat" pack, but sadly, Snake Bite wasn't available by herself - if she were, I'd have gotten her that way, without having to get Ogre with her. But even the two-pack cost less than $6 new, which isn't a bad price (though I didn't pick it up until it was on clearance, dropping that even lower). The Corps!' quality continues to lag behind GI Joe's, but only one of them is actually available in stores, and that counts for a lot.